Christmas Presents or Christmas Presence? When you’re down to nothing, God is up to something! Christmas devotinal for youth – How does God speak to you? With all the winter cold we’ve been having this month, it’s a great time to break out the crock pot or soup pot and cook up a big batch of comfort food – soup! At the base of every good soup is a good stock or broth. It is available in dry mix forms, bouillon cubes, canned broth or the shelf-stable boxed varieties. Or you can make your own. I’m relatively new to stock making, but already I love the flavor of the homemade stock better than the store-bought kind. And it’s not hard to make at all! Simply place bones and stock veggies ( like carrots, potatoes, celery onions, garlic – or any other veggies you like) into a pot. Add the spices you like and cover with an equal amount of water. Simmer the ingredients for up to 4 hours, depending on the type of bones used. Veggie broth only takes about an hour, chicken broth takes 2 hours and beef or ham takes up to4 hour hours to get a good stock. Strain it and discard bones and veggies, cool until any fat congeals on the top, then remove , portion it out into freezer containers and freeze. Save clean veggie peelings for a batch of stock later on. If you can’t use them right away, freeze them in a bit of water until you have enough. Save your bones from a roasted (rotisserie) chicken, as well as bones from deboning a chicken. If there aren’t enough for a good batch of stock, freeze them until there are enough. You can sometimes purchase beef bones in the store, but they can be pricey. You might be able to purchase “dog bones” from the butcher at a lower cost! I don’t have a lot of energy due to my heart condition, so I like to use my crock pot to simmer my stock. Just place ingredients into the pot, turn on low and slow cook up to 24 hours. Add a tablespoon of apple cider vinegar to your stock pot. It helps get more flavor from the bones. Roast your meat bones and veggies for about45 minutes before simmering for a richer flavor. Did you know you can make 2-3 batches of stock from your beef and chicken bones? Each batch will have less flavor and richness, but that broth can be used to cook rice or noodles for other dishes. 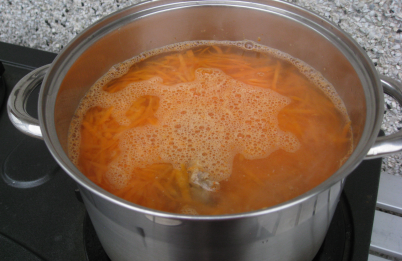 If you have some frugal tips for making soup stock, please leave a comment! Do Desperate Emotions Call For Desperate Measures?